It’s true that today’s students just aren’t what they used to be. Increasingly, the student body in higher education is being comprised of anything but our idea of the traditional young learner, bridging an academic journey with the first steps to their eventual careers. It’s a trend that’s forcing colleges and universities to evolve their social and academic experience to cater to the different needs and expectations of non-traditional students, and with this segment projected to grow more than twice as fast as traditional students from 2012 to 2022, it’s one that’s taking on an even greater urgency. “The makeup of these students is radically different,” explained Lisa Malat, Vice President and Chief Marketing Officer for Barnes & Noble College, during a recent National Association of College Auxiliary Services (NACAS) webinar. “Today, 40 percent of all students are over the age of 25, with almost 40 percent working part-time and more than a quarter having dependents of their own,” she remarked. 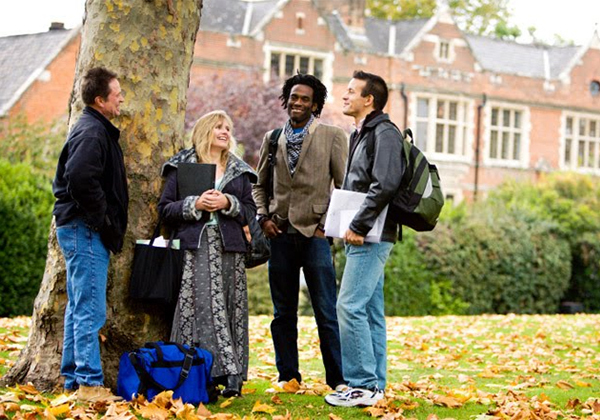 The webinar, titled Achieving Success for Non-traditional Students, explored how these students, often presenting a unique set of challenges, have very different and specific needs compared to their more conventional classmates when it comes to feeling supported and successful throughout their academic journey. This summer, Barnes & Noble College surveyed 1,000 traditional and nearly 800 non-traditional students, comparing their experiences in order to answer three fundamental questions. “The first was to understand the unique needs and social expectations of non-traditional students,” explained Marie Policastro, Director of Partnership Marketing for Barnes & Noble College. “We also wanted to identify the barriers to their success—and discover ways to help them to achieve greater levels of that success,” she added. 89% of non-traditional students consider their college education ‘moderately’ to ‘very’ valuable. Here, Malat drew a corollary with the company’s earlier research into Generation Z (Gen Z). 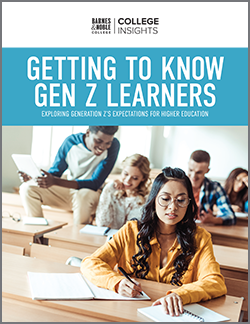 “Both groups showed they were more likely to attend college for career improvement or financial reasons, with Gen Z rating career preparation as their top reason in choosing a college. This is in contrast to Millennials who are more likely to base their college ambitions on seeking personal fulfillment,” she adds. While traditional students tend to rely on scholarships and family members to finance their education, non-traditional students were more often found to be juggling family needs with student loans. For this reason, they were more likely to request additional financial support or even quit their programs altogether. Pressures of life outside of their academic ambitions also seemed a driver for non-traditional students to highly favor online courses—and to welcome new technology with a preference for adaptive learning materials. In fact, 69 percent said the ability for them to take courses online was important, while 66 percent registered a preference for digital textbooks, and a third of respondents favored adaptive and collaborative learning. “These numbers provide a really good indicator to colleges looking to better deliver OER and adaptive learning materials, such as competency learning programs, that will support and enhance their success,” Malat said, pointing to the use of platforms, such as LoudCloud, to increase access to more affordable course solutions and provide students with the right academic support as they needed it. 69% of non-traditional students said the ability to take courses online was important. 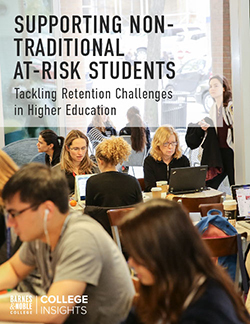 Another significant threat to retention is the disconnect that non-traditional students feel with their campus and their fellow classmates. “I have little in common with other students, and I am very busy outside of school, so I have never connected,” one said. “These students feel less socially connected as many spend less extra-curricular time on campus,” noted Tamara Vostok, Director of Consumer Marketing for Barnes & Noble College, underlining the importance of social support events, such as VIP Nights and De-Stress events, held at the campus bookstore. 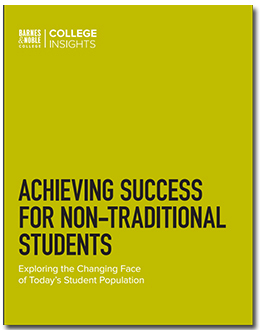 To download a copy of the Achieving Success for Non-traditional Students: Exploring the Changing Face of Today’s Student Population report, click here.